Upon arriving, we were greeted by the kind and welcoming proprietor, Joellyn. She made us feel right at home and showed us around the mansion, giving us a tour of the history behind so many of the immaculate details like the pocket doors in every room that allowed air to circulate through the house pre-air conditioning and original fireplaces imported from Europe. Each room in the Mansion is named after someone meaningful in the home's history- you can read all about them and see more pictures here. I think my favorite is The Grocer for it's light, airy pink tones and private porch. From the upper deck, you can see out over the bay and watch the cruise ships sailing in and out to sea. For a moment, you truly feel as though you've stepped back in time to when Galveston was a booming port town and life moved at just a little bit slower pace. I could spill secrets of this house all day but honestly, you should do yourself a favor and stay at the Carr Mansion the next time you find yourself on Galveston Island. Joellyn will no doubt make you a delicious spread for breakfast (her eggs benedict casserole is to die for), you can enjoy a cold drink in the pub, and cozy up on the big leather sofa in the parlor to read a book. Not a reader? Each room has a TV, which Zach was excited about (it's almost football season in Texas, ya know). The mansion also hosts events like weddings, showers, cocktail parties, and lots in between. 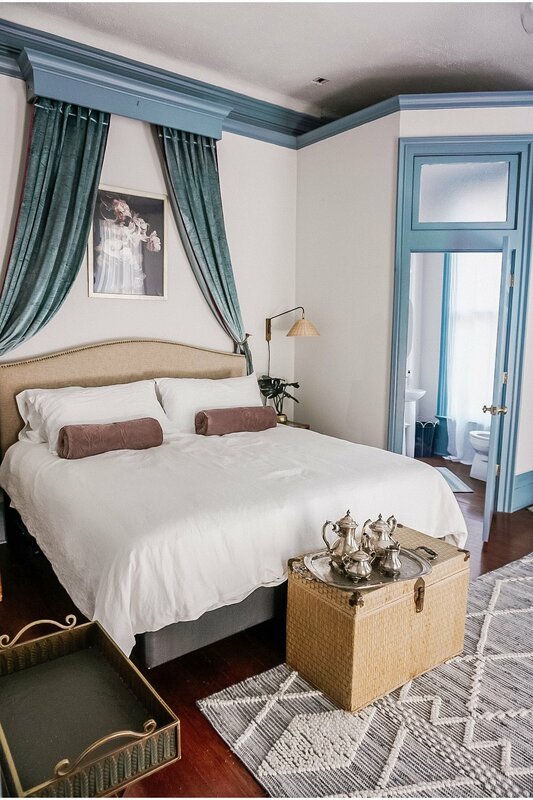 Whether you're heading out on a cruise and have a few nights to spare or are making Galveston your next travel destination, make sure and visit the Carr Mansion for a glimpse at history remodeled to perfection. Like us, you won't want to leave!